Kingdom of Westmarch - Amtgard - New to Amtgard? The previous is a quote from the Amtgard Rules of Play, now in its eigth iteration (currently still being playtested), and is an exemplary summary of our game. While reading the rulebook in its entirety is the most recommended first step for starting in our game, this page seeks to guide potential new players and showcase some of what our game has to offer, especially locally. Amtgard is a Live Action Role-Playing game (commonly reffered to as a LARP) and includes some of the usual tenants of LARP games: a medieval/fantasy setting, costumes (garb) from that setting, unique classes with unique abilities, and a combat system based around boffers (foam swords, spears, etc.) and magic. Typically a group meets every weekend at a local park and play battlegames of various and creative sorts where the players' martial and class abilities can determine their teams ability to achieve victory. In addition to battlegames, Amtgard has a rich cultural atmosphere where story telling, writing, singing, poetry, sewing, sculpting, drawing, painting, smithing, and much more are all encouraged and celebrated. If you identify yourself as being a resident of the state of California and/or in the vicinity of Carson City, Nevada, or even on the Island of Hawai'i, then we have got some options for you. 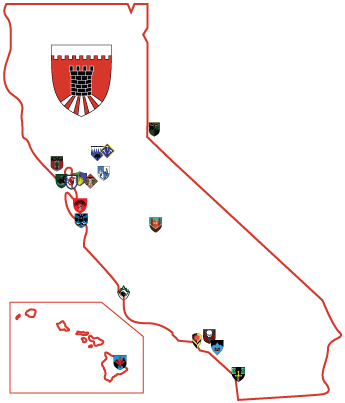 The Kingdom of Westmarch is comprised of the Nevada and Hawai'ian lands mentioned and Californian lands as far north as Sacramento and Rohnert Park, to as far south as Escondido and the greater San Diego area. Take a look at the Lands of Westmarch page to find a group nearest to you. For a new attendee all you need to bring is yourself. Present yourself at a park and introduce yourself as a new, interested player and you will undoubtedly find someone who can help you get started. The land's monarchy is always a good bet: in particular, seek out the land's Prime Minister to get started on the waiver required to play and seek out the Champion as well, to obtain some spare equipment and get introduced to the current game being played. To get a head start on the day's activities, give the Rules of Play a read through. In particular, check out the "Combat Rules," "Playing in Battlegames Made Easy," "Magic, Abilities, States and Special Effects Made Easy" sections in the most recent Version Eight Rules of Play. Do not worry about having your own equipment and garb the first time you come out: we will understand. You can gear yourself out over time as you learn to play the game. Just come on by a local park and get started on your adventure. If you have any questions not covered here, feel free to swing by our Message Boards, introduce yourself, and ask your questions.